As I told you in my previous Christmas Fruit Cake, it was like eternal search for an eggless version. Whether it was on Facebook or Twitter or even Buzz, all I was interested in was to search for a version that I can bake this time. Then I happened to see Monika talking about Christmas Cakes and I had to ask her if it was eggless. 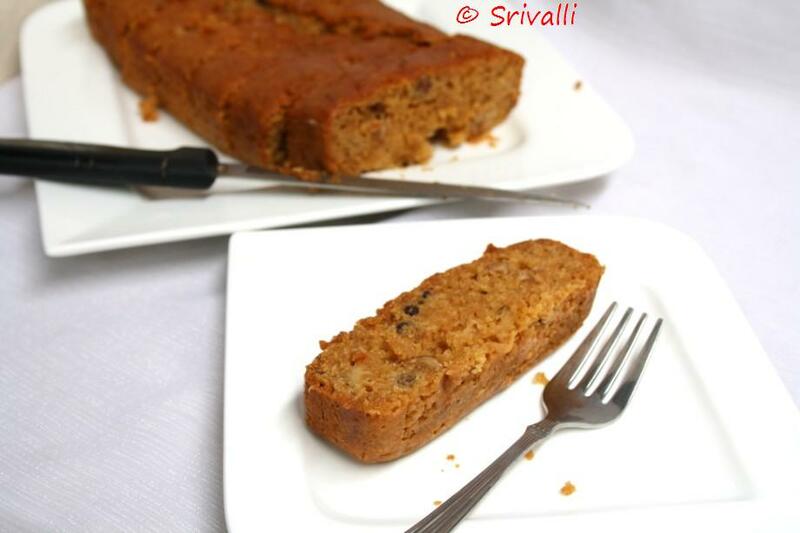 She then pointed me to Nandita who just blogged about two versions of Christmas cake, one which happens to be eggless. Reading that I realized it had Rum and had to get my share of rum. Everybody were very interested that I was soaking the fruits in Rum and whoever knew of this wanted a piece of cake to taste. Since I made the other fruit cake first, I left the fruits soaking for 4 days. Finally got around making it on Monday. 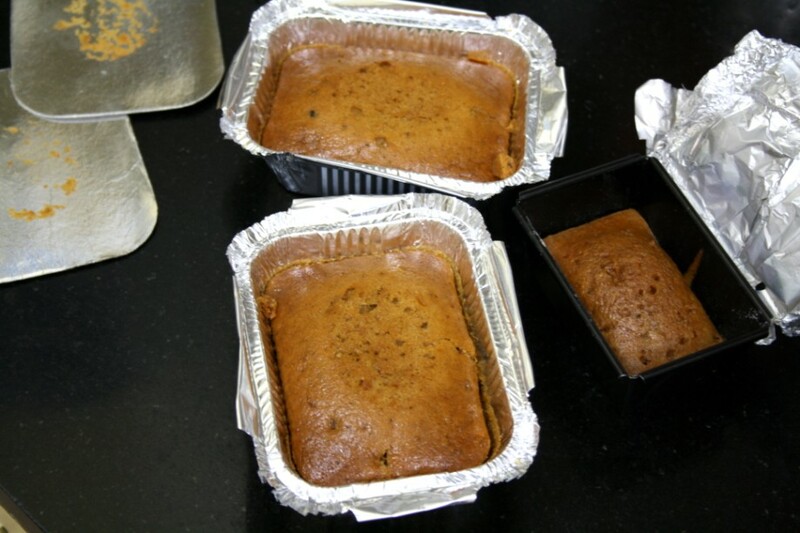 I baked a full pan, plus two small foil tins to take to office. Then a smaller tin in which I have been soaking it with more rum. Yet to get it tasting for the feel and taste of rum soaked fruit cake. 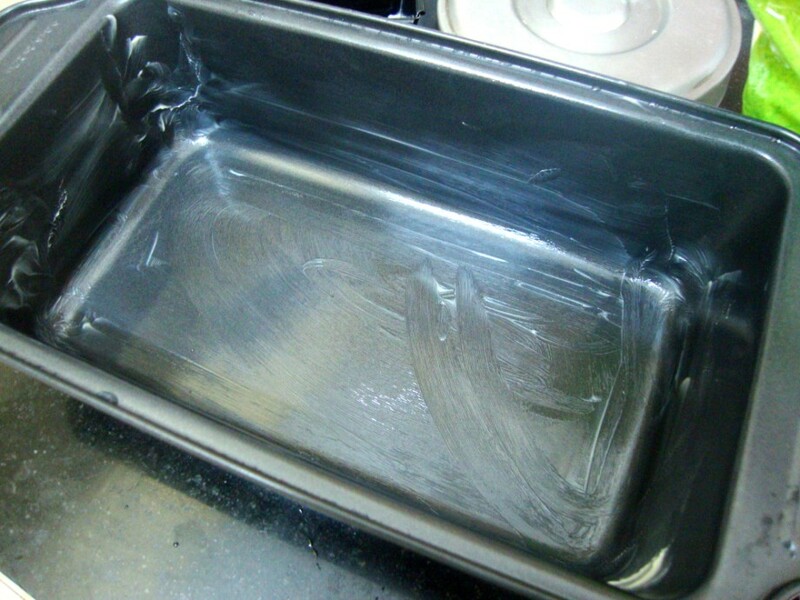 Loaf tin used for baking, greased and dusted before pouring the batter. Cutting into bite size pieces. Baked in small foil tins for carry away/ gifts. Further soaking in rum for 3 days. 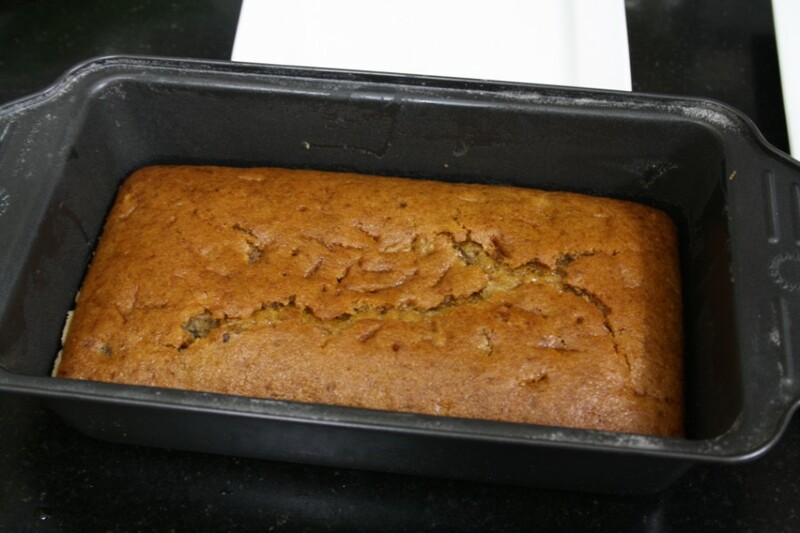 To prepare this cake you first got to soak the fruits few days before the actual baking. Normally some have the habit of soaking for weeks together. But I had only 4 days of soaking and it was fine. Else you can follow the cooking in sugar process that I did for the other recipe. Then you will have to make the caramel ahead of baking, so that it is also ready before starting the baking. 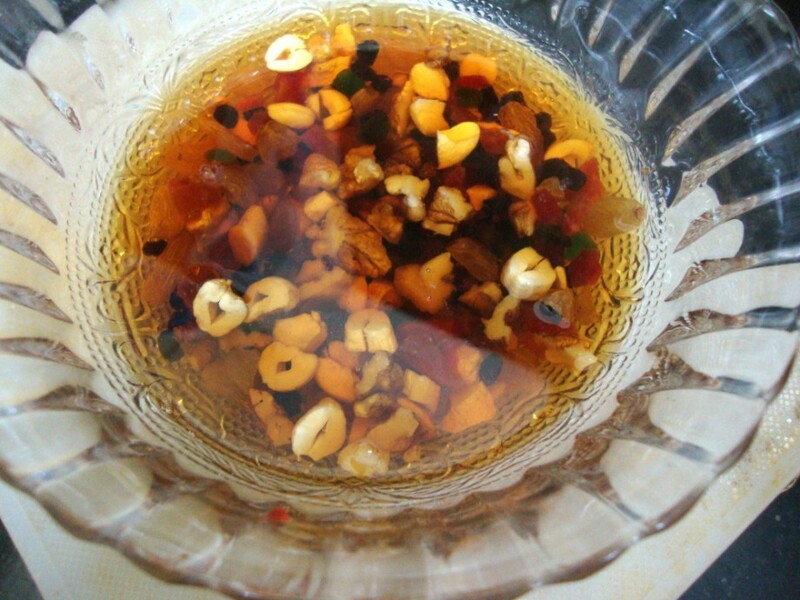 Though it is recommended to use 3 cups of mixed dried fruits, I did about a cup and a half. I didn’t use the cinnamon powder in the fruit soak. But used it directly. 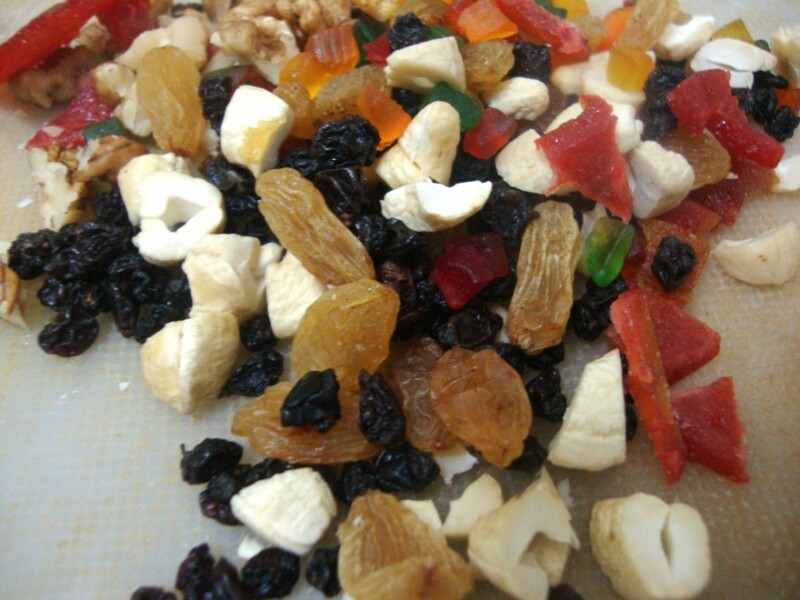 Cashew nuts, Walnuts, Black and Golden raisins, Currants, apricot, tutti fruitti, citrus peels soaked in 1 cup rum. Chop all the nuts and fruits into small pieces before soaking. One batch caramel required to make this recipe. To replace the eggs, I have also used the potatoes as the previous one. Pressure cook 3 medium potatoes to get 1 cup of finely mashed potatoes. Keep it aside. Grease one 8”x 4″ long tin and dust with flour. I used three small foil tins for gifting away smaller cakes. Baking time will be less in case you are using smaller foil tins. In a large bowl, whisk well the oil, yogurt, mashed potato, sugar, caramel, spices and vanilla. In another large bowl, sieve the flour, soda, baking powder and instant coffee powder. To the wet ingredients, add the dry ingredients in batches, folding well to incorporate. Once the batter is ready, add the soaked fruits and little liquor. Mix well and pour into the greased tin. Refrigerate the rest of the batter until you use. Bake for 30 minutes at 175 C and another 15-25 minutes at 150 C covered by foil. Test the center of the cake if it is done. Cool for 15 minutes in pan. Remove along with paper onto a cooling rack. Let the cake sit overnight before slicing. 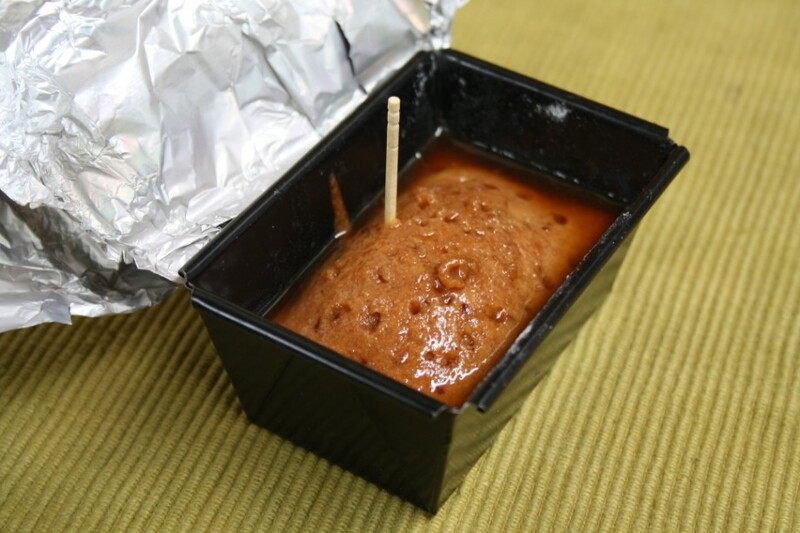 The remaining batter refrigerated until use. Please check the temperature setting in your oven, it can vary. 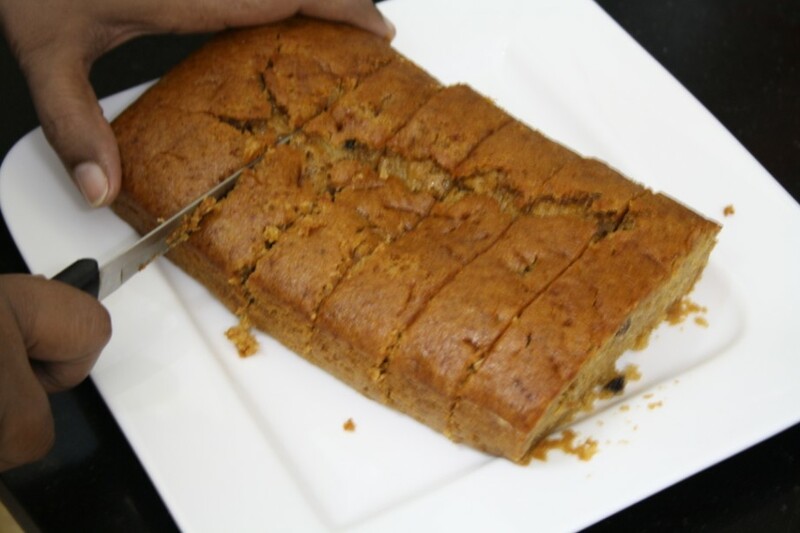 The basic principle being since this is a dense fruit cake made using oil, cooking this for longer time in low temperature gets it done. Thanks for the entry Srivalli. I had never seen use of potatoes in place of eggs. Very interesting though. Happy New Year. 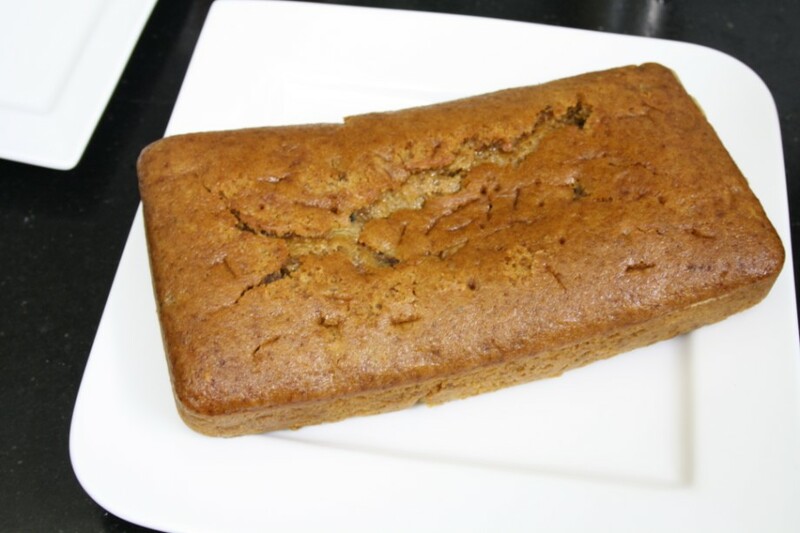 Eggless Rum cake looks awesome. Must have tasted great as well. Happy New Year in advance to you and your family. unbelievable result…egg less butter less make it totally guilt free.never knew we can use potatoes for butter and eggs. A very Happy new year to you and your family Srivalli. Looks delicious and must have been a very aromatic one too. good one– have a great year 2011! Omg, u just tempts me with ur delicious and gorgeous fruit cakes Valli, awesome! Looks so soft and awesome !! Amazing looks soft, moist cake, loving it. Had too much of cake this Christmas. But irresistible. 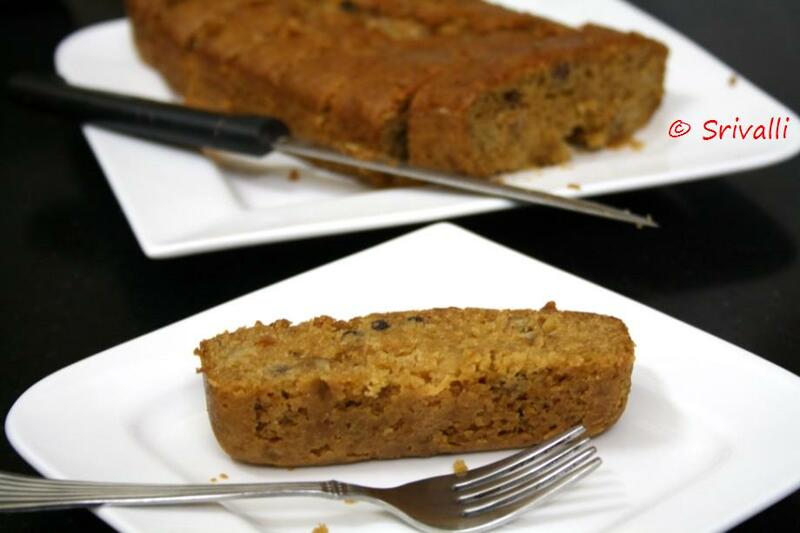 This is a awesome recipe, i tried this recipe for cake for first time. It came up so well. I am a naive cook and was skeptical about trying the recipe as this was first time i was baking anything. But compliments i got after serving the cake made my day. Thanks a Tonne.